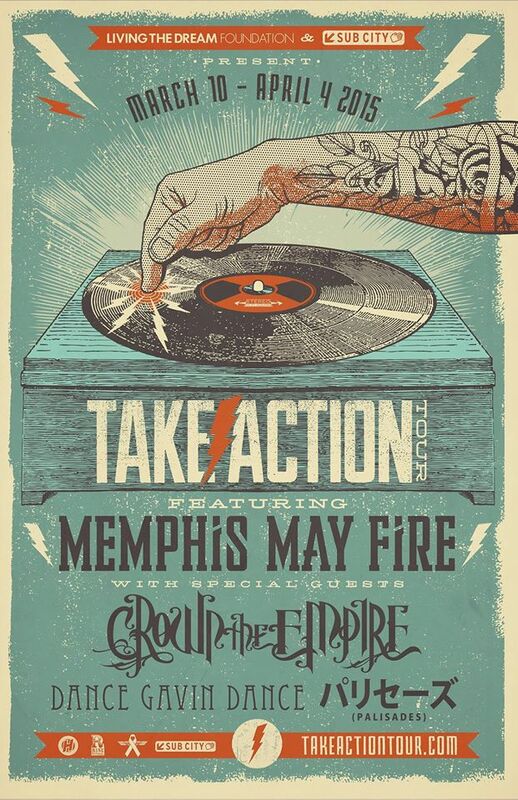 Just when you thought spring tour announcements were winding down, Memphis May Fire have sprung into action announcing that they will be headlining the 2015 ‘Take Action’ tour. Crown The Empire, Dance Gavin Dance, and Palisades will be joining this exciting spring lineup as well, as they travel the road in March and early April. The final date in Tempe, AZ will be a festival date for Memphis May Fire alongside A Day To Remember and The Offspring. You can purchase pre-sale and VIP tickets now and general admission tickets on Friday, Jan. 30 at 10AM here. All proceeds of the ticket purchases will be going to the Living The Dream Foundation, a non-profit organization that provides aid and hope to children with life-threatening diseases. You can view the tour dates below. Mar 21- Grand Prairie, TX @ South By So What? !